njRAT Trojan also known as Bladabindi, is a Remote Access Tool (RAT) that was first seen in 2013 and has been extremely prevalent in the Middle Eastern region. njRAT was developed using Microsoft's .NET framework and like many other RATs, provides complete control of the infected system and delivers an array of features to the remote attacker. We have seen attackers leveraging popular gaming & software application cracks & keygens as the lure to infect end users. There have been many variants of njRAT. H-Worm, also known as Houdini, is one of the most popular variants and was reportedly used in attacks against the international energy sector. In this blog we will provide a brief overview of njRAT and H-Worm as well as an analysis of the H-Worm activity we've seen over the past few months. The njRAT Trojan remains one of the most successful RATs in the wild because of the wide spread online support and tutorials available for cyber criminals. There are a variety of .NET obfuscation tools that make detection difficult for antivirus solutions and hinders analysis by security researchers. njRAT utilizes dynamic DNS for command and control (C2) servers and communicates using a custom TCP protocol over a configurable port. H-Worm is a VBS (Visual Basic Script) based RAT which we believe is derived off the njRAT source code. 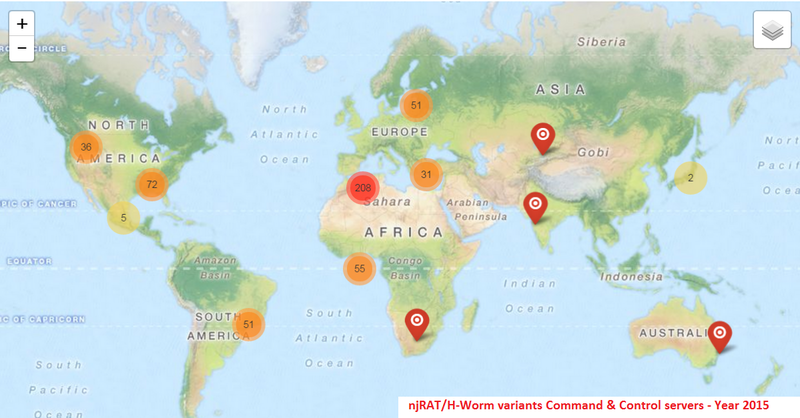 H-Worm provides cyber-criminals similar controls to njRAT. It also uses dynamic DNS for its C&C servers but unlike njRAT it uses POST requests and the HTTP User-Agent field to exfiltrate sensitive information from the infected machine. USB spreading [true/false] with date obtained from bot's registry entry. njRAT & H-Worm variant infections continue to rise, and while this threat is reportedly more prevalent in the Middle-East region, we continue to see infections in other parts of the world as well. Despite Microsoft's attempts to disrupt the C&C channel for this notorious RAT back in June 2014, we continue to see the usage of various dynamic DNS services by the malware authors for it's C&C server communication. It remains one of the most popular and prevalent RATs in the wild today. Zscaler ThreatLabZ has deployed multiple layers of protection against this threat to ensure that the customers are protected.